Forrest Griffin vs Rich Franklin UFC 126 | MMA Fighting Events Videos Techniques UFC Fight Picks and News. 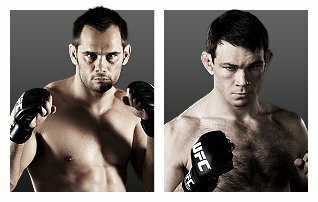 The co-main event at UFC 126 featured Forrest Griffin vs. Rich Franklin. Fight fans had been looking forward to this fight, as both Griffin and Franklin share many similarities. Griffin and Franklin are both former UFC champions. Because of their easygoing personality and great fighting skills, they are both fan favorites. Griffin and Franklin also like standing, throwing chingasos and ending fights with their hands. 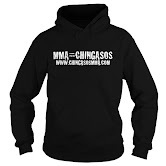 (They both received devastating chingasos from Anderson Silva, but that’s another story.) However, the question remained, would their match up at UFC 126 live up to expectations or simply fizzle? In round 1, Griffin and Franklin showed their respect for each other by coming out with a cautions feeling out process. Both Griffin and Franklin, threw their own kick to gage a reaction. Franklin threw another kick, which Griffin caught and used to get a takedown. Franklin put Griffin in the guard, and Griffin tried to get out. Franklin was able to keep Griffin in the guard despite all of Griffin’s pass attempts. The round ended with Griffin throwing some chingasos, in the form of ground and pound. Round 2 began with both fighters throwing their share of chingasos from the stand up. Again, Franklin threw a kick that Griffin caught and used to get the fight to the ground. Griffin tried to take Franklin’s back and used chingasos to soften him up. Franklin was able to get back up, but Griffin threw him back down to the mat. Franklin was able to get off the mat again, but Griffin caught him with a left right combination that also included a kick. Franklin and Griffin both threw more chingasos to end the round. The third round began with Franklin throwing a kick and each man throwing their own combinations. Griffin went for a takedown, but Franklin was able to fight it off. Franklin and Griffin clinched. Griffin got a whizzer and was able to use it to throw Franklin to the ground. Franklin was able to get back up and each fighter threw a combination, once again. Griffin got another takedown and went for the finish. Franklin got up and was able to get his own takedown. The fight got to the feet again and Griffin got the takedown. The fight got back to standing before the fight ended. Forrest Griffin got the unanimous decision over Rich Franklin. Forrest can now move beyond UFC 126 and line himself up for a title shot in the near future.